Can you believe it? It’s already second half! Let’s not start with a cliché about time though. You know how it is nowadays. Let’s start with the cold cliché. July. *shivers* You sit by the jiko nowadays, even as you browse the Internet. Your cat too. 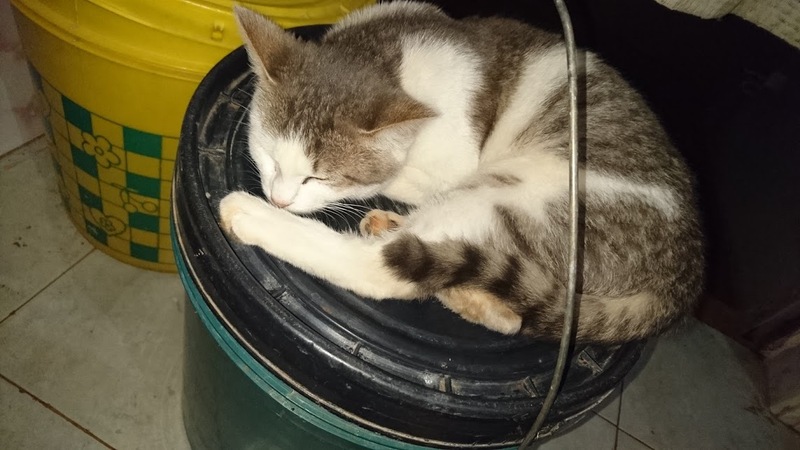 But she prefers the hot water bucket next to you. You wear twenty pieces of cloth during the day. You even campaigned for a heater in the office. No one wants to walk to lunch in the fog. You all wait for someone to volunteer to bring it. You don’t complain about the car A/C being on. Heck, you turn it on yourself to rise above the 12 degrees outside. This year is different though. No cheesy texts from dudes asking what’s keeping you warm. Whether they can help. You pretty much closed that chapter officially. Only positive vibes, Positive energy. Constructive discussions. Anyone who dares brings trash to your space gets shut out. You finally (FINALLY!!!!!) get that new mattress. Of course not without some drama. You and your all-knowing dad drive to the supermarket, confident you have the right measurement for your beds. (Side note: he used a string.) You shop around every supermarket in the vicinity and finally the cheapest. You make the purchase, haggle over transportation cost and hit the road. Your days of sleeping on a boat of a mattress are gone. Then you place it on the bed and it does not fit. Anti-climax. Lesson learnt. Soma lebo next time. Eventually the supermarket orders the right size and you get your mattress. Sema struggle ya kuamka! Not like you are not known for snoozing your alarm from 6:30 all the way to 7:00. Even your sister has mastered your alarm tone. But this makes it even worse. It’s good for your back though, and it’s not like you’re getting to work late. Far from it. You finally (FINALLY!!!!!) can drive yourself to work. One day you are claiming how the first day, you will leave with Ls all over the car. The next, your dad is like, Ls for what? And you are out before you know it. Every single thing that would freak you out does not daunt you anymore. The corners. The bends. The parking. The traffic. The trucks on the bypass. The reversing. All these things are just at the back of your mind now. Meaning they did not disappear. They should not disappear. You should always be very alert on the road. Very. Extremely. In fact, you don’t make stopovers anywhere, yet. Work. Home. No. Stopover. Plus you have put a scratch on it twice. Not on the road but on the garage door. Let’s accept it. That garage is tricky to navigate. Baby steps. You now know cars. Models. Car parts. The cost of petrol, or like my American peeps would say, gas. Your dad and mum have everything to do with why you can do this. Their confidence keeps you going. Talk about Vision 2017 coming to completion early? Who knows what other door will be opened soon? Did you hear somebody say amen? You are still in the start-up game. Lots of drama every day. Lots to do. Lots to process. Major lessons learn every day. You fail. You get up. You fight change. You think. You improve. You try to embrace the changes. You help each other. You exchange notes. You live to fight another day. Give your all, go home and catch up with the world. The world that seems to be running amok. Schools burning. Like who tells kids to burn schools? What goes wrong in their heads? Like you only have very few months to go and you’re burning your own bread and butter? Smh. Someone running over people in a truck. A scene right from Stephen King’s Mr. Mercedes. Someone shooting people in a part of Kenya that does not get that much coverage. That is just sad. Someone running a campaign to help people but all someone else can think of is pointing fingers and insisting that the campaign does not make sense. That the government should do something. You think to yourself, will the government come and tarmac your dust road when some of your neighbours completely refuse to contribute to the neighbourhood initiative to at least get some stones? Anyway, enough of that. Story for another day. You waited for Kenyan cinemas to show Me Before You. You and your BFF. You waited for months. You fought the urge to acquire it by any other means. And then you found it. And, ladies, wait for it. You. Did. NOT. Cry. Like seriously. Why did they have to change up stuff? You keep asking each other if that was how it was in the book. For once, you can see that movies are very weak representations of the book. You feel very strongly about this. You even shed a tear toward the end, not particularly because you’re moved, but because you kinda feel bad. BFF cries nicely though. Maybe you need a checkup. You cry over Suits for crying out loud! You cried while reading the book! There is something changing in you, perhaps. Maybe. Or you just had expectations that were too high. Your BFF is having thoughts of hooking you up. Let’s all laugh. She has a point though. Thinking up ways of being out there meeting new people. Plays. Book clubs. That event that has the name blanket in it. LOL. This one made you laugh out loud. Interesting places to visit that are not all that interesting from first glance because they are right next door. Volunteer somewhere. The opportunities are limitless. As far as that goes, these are only ideas at the moment, yet to be exploited. You will wait and see what they birth. You want to pretend the blog does not look different. Come to think of it, it does look different, right? Still purple but different. I missed you, voice in my head, lady. Going through a lot of growing pains lately, but here’s to embracing change. Liking the new website design/layout. It’s Mrs. now 😀 hehe!